Roger Federer needed just one hour and 33 minutes to dispatch Philipp Kohlschreiber 6-3, 6-4, 6-4 on Saturday at the US Open. The second seed advanced to the Round of 16 in New York for the 15th consecutive year, extending his ATP Head to Head series to a perfect 10-0 against the German. 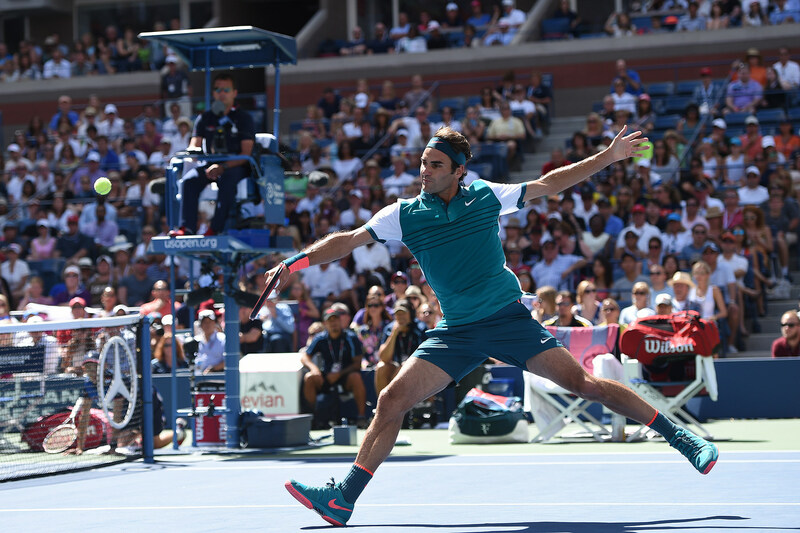 Federer fired 27 winners including five aces, while converting on five of eight break chances. He conceded his first break of serve since Wimbledon, when Kohlschreiber broke to love in the fourth game of the second set. Federer had held in 78 consecutive service games in Cincinnati and the US Open combined. He improved to 19-0 against Germans at Grand Slams since falling to Tommy Haas at the 2002 Australian Open, and is just six match wins from becoming the first player to claim 300 at the Grand Slam level (294-48). "Today I got off with a good start and held my serve throughout the first set," said Federer. "Then, I lost a little bit on my serve. There was hardly any rallies anymore. I couldn't play as many rallies as I was hoping to, especially on the return games, because I thought he was doing a good job doing the 1-2 punch. Then that's not much rhythm, to be quite honest. "I think because of my serve and no rhythm, I might have gotten broken as well a couple of times in sets two and three. It's exactly those kind of matches I need to win. Especially if I drop serve, I still find a way and I don't want to say comfortably, but I get maybe a little bit lucky at times. When I had the opportunities I was effective again. I think I won the big points better than he did today. He's a quality player, so at the end of the day it's a really, really good win for me." The Swiss continues his bid for a sixth title at Flushing Meadows when he tangles with John Isner in Monday's fourth round. No. 13 seed Isner advanced when Jiri Vesely retired down 6-3, 6-4 with a neck injury. The top American hammered 46 winners, including 21 aces. Federer owns a 4-1 advantage against Isner, but this will be their first encounter since the 2012 Summer Olympics. The second seed won their most recent hard-court meeting in the '12 Indian Wells final, while Isner's lone victory came on clay in the Davis Cup first round earlier that year. "He's got the power. He's so tall, he finds the impossible angles for us," Federer said of the American's serve. "And has a great second serve as well. I need to make sure I protect my own serve. Part of trying to beat him is just to stay with him." "It's focusing point by point," he said. "Understand the percentages, what has and hasn't worked so well throughout the match. "In the beginning you try to find the rhythm. Then once you found it, how much do you mix up speeds and slices and big serves to keep him off balance. "I tend to like the body serve as well," added the Swiss tactician. "Sometimes against John maybe that's not a bad play just because he's very long." Isner will hope to notch his seventh Top 5 win and equal his best result at his home Grand Slam, having previously advanced to the quarter-finals in 2011 (l. to Murray). "It's going to be fun," Isner said about facing Federer. "It's what I work so hard for, to get an opportunity like this. On Monday I'm going to have fun with it. At the same time, I'm going to go out there and believe that I can win the match. "I'm playing well. Definitely conserved a lot of energy. I'll be able to leave it all out there on Monday, win or lose. A lot of times I play long matches, but I have been on and off the court pretty quickly my first three matches. That bodes well for me. Same goes for him, but he's generally in that position. I'm going to go out there and roll the dice."